This is a great graph on the biggest reasons you should be drinking plenty of water. Of course my advice is to be drinking Kangen water. Ph level is high and is an antioxidant water. You really need to learn more about this Kangen Water so I advise to go to http://www.lifechanging-water.com and get your FREE – 8-page eBook that is packed full of information to educate you on the hidden power of what our product can do. Learn about the health benefits this product can have on your body. This book has been in the making for the last 12 months and at last I have finished it. 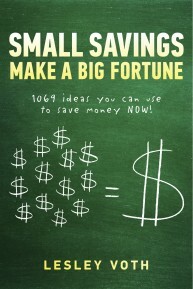 My New eBook, Small Savings Make A Big Fortune, is full of great helpful upfront tips to save money everyday. It’s great for the kids and adults alike. The eBook contains 1069 useful tips on saving. If you are not saving then you will be finding it difficult or totally unable to make money. You cannot make money out of ‘thin air’ as they say. The object of this book is to save money then be able to make money. We don’t know which way the economy is going to go, and I do not like dwelling on the negative, but it does not look good. We need to position ourselves against another grim reccesion if that is to happen. You can download this book for ONLY $1.99, it will be money well spent. It is available from Amazon.com on Kindle, Apple iBook, Barnes and Noble on Nook, Sony on eBook Reader and other ebook sites. Make a start. Click here to learn more! I know I have been filling this space with video’s lately but I love those good feeling video’s. The other reason is that I am still busy getting my new EBook ready for publication (1001 saving tips, I am not sure if I will call it that, but that is the content ) so I have not had a lot of time to write articles. Hopefully that will happen soon.